Of all the executive resume writing tips you will receive, effectively communicating you can meet the demands of hiring managers and executive recruiters is the most important. Endless lists appear in top business magazines every year on the desired skills and attributes of a chief executive. These qualities are gathered from thousands of executives with hiring authority from the board of directors and executive suites of companies. As an executive resume writer with 16 years of expertise, it is not unusual for a resume to land on my desk for a review that is supposed to be targeted to executive positions and have none or very few of the qualities listed in the best CEO lists. If the core competencies are listed, no evidence may be provided to back them up through examples, context, and quantifiable evidence. The resume summary or profile is the most important part of your resume. It is a snapshot of your key qualifications. Your choice of words will decide whether or not it is read. Use keywords that will be picked up in a resume database search. Reflect the skills and qualifications asked for in the job advertisement. Do not hesitate to rewrite and reposition your summary to optimize your word choice for the targeted positions. George, for example, is president of a mid-sized company who rose through the ranks as a top salesperson. He has developed one summary for executive vice president of sales positions – with a stronger emphasis on sales leadership and performance – and another for chief executive positions. Placing the title of the role at the top of your executive resume will allow the reader to know instantly what job you are targeting. Develop and maintain a clear message can be the biggest challenge for an executive resume writer. At this stage in your executive management career, you have accumulated impressive knowledge across multiple disciplines and levels of responsibility. If you have made it to the executive suite, you have accomplishments to brag about in each position. A good guide is to match the desired skills of the job posting. If it is a sales executive job, for example, focus on the sales expertise and performance asked for in the job posting. Mirroring or matching the job position will help you stay focused. This process will help you develop several different resumes for different executive jobs if required. You will be able to identify weak areas or gaps in your resume. Core competencies such as collaboration or change management may have inadvertently been left off. A major mistake when writing executive resumes is dumbing down the language. An executive expresses himself differently than, say, an administrative assistant. 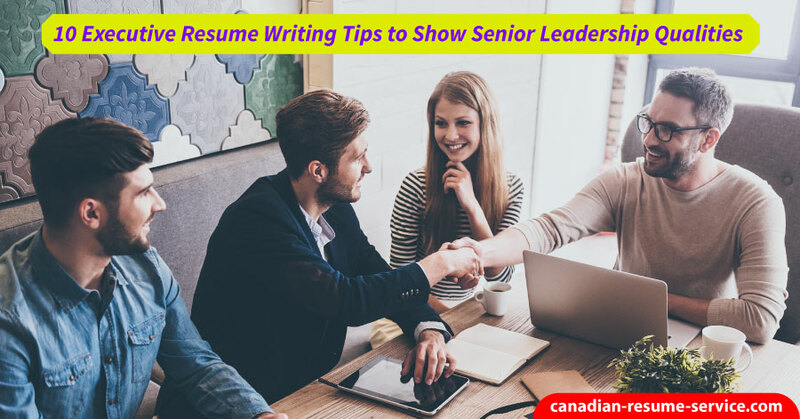 A company president who has worked himself up from a sales rep to the executive suite will convey wisdom, knowledge, and maturity in his editorial tone. The two main ways this dumbing down happens is by copying standard cover letter examples and having non-executives write your resume. Don’t let your writing come across as bland, mundane, or routine. Always make sure that you convey that you are a trailblazer, problem-solver, and leader. A thorough resume writing company will provide you with a questionnaire, enabling you to communicate your experience, qualifications and career objectives showing you are genuine. An executive must have strong human relations skills to productively interact with employees, shareholders, clients, suppliers, peers and the board of directors. Many resumes list a standard set of traits – team leader, generous, listener, motivator, and so on. These words are hollow if you do not back them up with evidence. Providing examples of each soft skill listed makes them more convincing. These examples may be provided under your practical work experience. Empathetic leader who truly listens to employee concerns through a 360-feedback system, implements teams to analyze problems and applies a performance measurement system to measure progress. This CEO has three mechanisms for gathering and acting on employee concerns, and no doubt delivering results. They don’t just highlight the skill, they provide a concrete example of how this played out to the people they led. John Chambers—former CEO and now Executive Chairman of Cisco—has remained at the top of executive performance lists for 20 years. He has consistently delivered sales results. From his early days in the press, something else has distinguished this tech leader – his Southern gentility. Shareholders, the press, customers, employees and the board of directors like him and consider him a ‘gentleman.’ In one business journalist’s encounter, both Chambers and his PR man introduced themselves as ‘Southern gentleman’ within the first 30 seconds of the meeting. You, too, can shape your audience’s opinion of you by describing your communication style to them in your resume. Let the reader know who you are: open, attentive, empathetic to demonstrate soft skills. Note the power of metaphor: a Southern gentleman conveys many fine qualities in our minds. Consider: provide the clear and concise directions of a drill sergeant in an open, flexible tech culture to cultivate the best ideas (a collaborative Silicon Valley workplace comes to mind). I am mixing my metaphors here, but you get the idea. This also ties into your personal “brand” so others know how to perceive you before they even meet you. So how can a senior-level executive write a resume that stands out? As you know, you will be asked to make many decisions each day. Your potential employer wants to know how you analyze problems and make decisions. Decision making can involve many stakeholders and information sources across different disciplines. Show that you can effectively compare opinions and proposals, think quickly and decisively, and make change happen. Making a general statement such as ‘sound decision maker’ may not be convincing enough. Examples of how you have made logical decisions in specific contexts and under pressure will demonstrate how you think. Whenever possible, also report the quantifiable results that resulted from your effective decision-making. In an increasingly challenging global world, executives need to have sharp analytical skills to identify issues and practical problem-solving skills to develop solutions. If you can show innovativeness, you will get even more points. If you can also show that you can solve these issues at a low cost to the organization, you’ll make yourself an even more valuable asset. Innovativeness can create simple and elegant solutions, such as starting a Twitter account to post employee problems and solutions and boost productivity. Companies have to address many challenges in a day. Real examples are far more influential than blank statements. Did you raise financing during an economic downturn? Did you restructure the workforce and boost productivity? Include examples of times when you’ve also had to conduct a well-rounded analysis in order to solve a problem. This shows that you have the ability to examine issues and solutions from all angles and determine the potential impact on all stakeholders. Doubled sales in one year through effective coaching a team of 20 sales executives. Saved $300 million in annual costs by applying analytical and technical skills to solve XYZ technical problem. Boosted employee productivity by 250% by developing a new mentoring program. Turned around an underperforming territory, accelerating sales to 125% of prior year’s revenues. Built division from $15 million in annual revenue in 2015 to $38 million in 2016. Read each accomplishment without the numbers to back them up. You get the point. Hard numbers have influence. Increased sales by 200 percent. Increasing sales by this much in the midst of an economic downturn, during an industry down cycle, or when the most powerful company in the world just entered your space is an extraordinary achievement. Good executive business leaders can motivate people to achieve exceptional performance. If you are in sales it is important to dig deep to find quantitative sales related accomplishments. Context also helps you make the match between your qualifications and the targeted job position. Compare the above statement with increased hi-tech parts sales 200 percent in Southeast Asia. Perhaps the sales director is hiring for Latin America but is facing the same commoditization and competitive challenges he experienced in Southeast Asia. Your resume will be prioritized. As a rule of thumb provide context by answering: What? Where? and When? As you can see from these executive resume tips, you can separate what makes a good executive resume from what makes an excellent executive resume. Present your resume with an executive design that communicates: corporate, professional, respect. A thin dark blue or burgundy border is an example of a conservative, corporate design element you may want to add. Use searchable, conservative font, add a touch of traditional color if it suits your personality. Need some writing help making a stellar executive resume, cover letter or CV curriculum vitae? Take the time to review and order one of our resume packages or individual services. Have questions about how to get started with our executive resume writing service or anything else related to your executive career? Please connect by sending an email to Candace or call toll-free at 1 877 738-8052. I would enjoy chatting with you about any of your executive search needs.